One of the most fun, kid and family-oriented concepts around is looking for a talented, motivated, and hands-on Senior Assistant Manager to join their team. You must come from a systems background, have high-volume experience with operations of at least $2 million in revenue, use a people-oriented approach to mentoring and leading your team, and thrive on providing nothing but the best customer service experience! I love making a difference in candidates’ lives by finding them an opportunity that is the perfect match. Equally, I thrive on providing my clients with talented managers and leaders that make a lasting positive difference in their businesses. 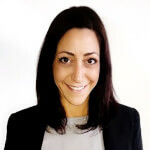 Natalie Maroufi joined Goodwin Recruiting in July 2017. Originally from Germany, Natalie came to the US in 2010 to open a small restaurant in New York City. Before then, she studied International Business in London. Instead of pursuing a career in finance, she decided to follow her passion for people and hospitality. Natalie studied Biochemistry at Ludwig Maximilian University Munich and International Business at London Metropolitan University in London. In her free time, Natalie loves doing anything outdoors, traveling and getting to know new cultures, reading, and learning about history and politics.